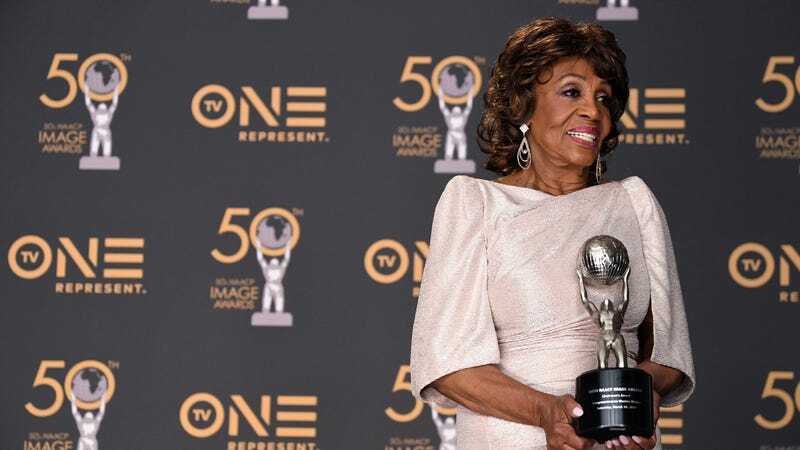 Congresswoman Maxine Waters, Chairman’s Award Recipient, attends the 50th NAACP Image Awards on March 30, 2019 in Hollywood, California. There is nothing like celebrating our own and highlighting black excellence amongst our family. The NAACP Image Awards is just that—a family reunion that is black as hell. I appreciate that. This year is a special one—the 50th NAACP Image Awards, once again celebrating the best in film, television, music, literature, and social justice figures. I had the honor of attending my first NAACP Image Awards this year, so I wanted to experience it all: the behind-the-scenes press day, the red carpet, and the press room on the big night. The red carpet was full of talent, including but not limited to: Yvonne Orji, Issa Rae, Winston Duke, Sheryl Lee Ralph, Larenz Tate, Kofi Siriboe, John Legend, Anthony Anderson (the evening’s host), Ne-Yo, Raheem DeVaughn, Marsai Martin, Tom Joyner... just to name a few. Like many award shows, there were fan bleachers. As we stood on the press line awaiting to interview the talent, we heard various screams, but there was one particular moment where the screams were hysterical! We all wondered where it came from, and who prompted it. Moments later, I got my answer: Mr. Michael B(ae) Jordan, himself. “I have the gavel, and I’m not afraid to use it!” exclaimed Rep. Maxine Waters, when accepting her Chairman’s Award. And by the end of her speech, she had us all chanting it. Y’all know black folks love a call-and-response chant. Jay and Bey were in the building as Jay accepted his President’s Award, which he dedicated to his 93-year-old grandmother Hattie White, his mother Gloria Carter, and of course, his lovely wife. “I grew up knowing I could do anything because of those strong women in my life,” said Jay Z. Black Panther won big tonight because we really did mean it when we said Wakanda was forever. Wakanda is forever winning, too! Chadwick Boseman won Outstanding Actor in a Motion Picture, Letitia Wright won Outstanding Breakthrough Performance: Motion Picture, Ryan Coogler won Outstanding Directing in a Motion Picture, Danai Gurira won Outstanding Supporting Actress in a Motion Picture, Michael B. Jordan won Outstanding Supporting Actor in a Motion Picture, and many more. The hugely popular film took home a whopping 9 statuettes. As far as TV, Black-ish was the blackest of excellence, taking home six statuettes. Two were won by Marsai Martin (who I lovingly refer to as Yung EP) - Outstanding Performance by a Youth (Series, Special, Television Movie or Limited-Series and Outstanding Supporting Actress in a Comedy Series! The show also won Outstanding Comedy Series, while Anthony Anderson took home Outstanding Actor in a Comedy Series. Tracee Ellis Ross accepted the Outstanding Actress in a Comedy Series award in a tearful speech dedicated to her mother Diana Ross, and much more! Overall, the press room was a safe space of black reverence, celebration and general “yaaasss”-ing. At this point in my career, I’ve been to many award shows, but this one feels like home. For the full list of winners, head to naacpimageawards.net.